Nine games were on the docket on Saturday (docket is a fun word to say... I think people become judges simply so they can talk about what's on their docket. But I digress), so let's take a look at the games, ranked by most impressive Big Sky performance to least impressive. The Grizzlies had perhaps their best offensive performance of the season, led by one of the best performances individually by anyone in the conference all year. Kareem Jamar posted a triple double with 21 points, 11 rebounds, and 11 assists; and as Bob Meseroll points out, the scary thing is that he is just a sophomore. It was the Grizzlies first triple double in over 30 years. 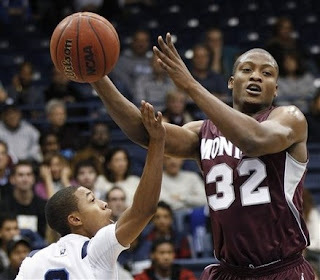 Will Cherry also had 24 points and five steals, as the Grizzlies shot 58% from the field. Seriously, just go ahead and clear February 28th on your calendar. I tweeted a bunch about this game, so you can check out my timeline for more thoughts if you so desire. This game was a battle throughout... Weber State kept knocking down big threes, and UT-Arlington kept responding. In the end, WSU escaped with a two point win, and were glad that there weren't a couple more minutes on the clock. Damian Lillard had a solid night with 17 points, seven rebounds, and seven assists, but was limited by some foul trouble (mostly on questionable offensive foul calls). WSU had trouble with UT-Arlington's pressure, and uncharacteristically had 19 turnovers. It was tight, but they will take the win, their 16th straight at home. It was easy to come out of this game impressed by both teams. The bright future of the Bears program was fully on display in this game, led by redshirt freshman Tevin Svihovec, who had 34 points for the Bears, and has certainly joined the freshman of the year discussion in the Big Sky. He was fantastic, shooting 11/16 from the floor, and 10/11 from the foul line. He does not have great athleticism, but he has a great understanding of the game and how to get his shots. He is a pleasure to watch. Emmanuel Addo was also solid, with 13 points and five rebounds. He is one of the most versatile big men in the conference. The crazy thing about UNC is that they will lose only one player this year (Mike Proctor), and they still won't have any senior on next year's roster (assuming a couple juniors currently suspended don't come back). Tough to see them lower than three in preseason polls next year. Idaho State obviously lost in an excruciating manner on Saturday (though some other Big Sky teams may say they got what was coming to them, after ISU has won a few games in similarly dramatic fashion), but they battled well. They took a lead with 4.3 seconds left on a Melvin Morgan free throw, but Pacific took it the other way for the game-winner. It was good to see Chase Grabau back and playing, and he had six steals on the night. One concern continues to be ISU's lack of depth - they played six guys last night. Six. Abner Moreira and Andre Hatchett both went the full 45 minutes. PSU finds themselves at fifth on this list almost be default, as they did not play a great game. Idaho led by as many as 19 in the second half, though the Viks should be commended for continuing to fight. Kyle Barone had a great day for the Vandals, surprisingly having his way with PSU's big men. Charles Odum led the team with 17, and Renado Parker continued to show why he is going to be the centerpiece of next year's team, as he had 14 points on 7/11 shooting. This was a tight back and forth game that featured 12 lead changes, but ultimately the Eagles came up a bit short. EWU did a good job of forcing turnovers (23 of them) but they could not stop UC Irvine from putting it in the basket when they did shoot - the Anteaters shot 62% from the floor. The Eagles had five guys in double figures, but shot just 34% from the floor. When you compare the shooting difference to the point difference, it is obviously that EWU dominated a lot of phases of the game. Alas, it was not enough, as EWU falls to 12-15 on the year. The Hornets led by six at the break, but as has been the case at different times this year, they were not able to hold onto the lead. They got a career-high 24 points from Jackson Carbajal and 12 more assists from Dylan Garrity, but just couldn't put enough stops together for the win. 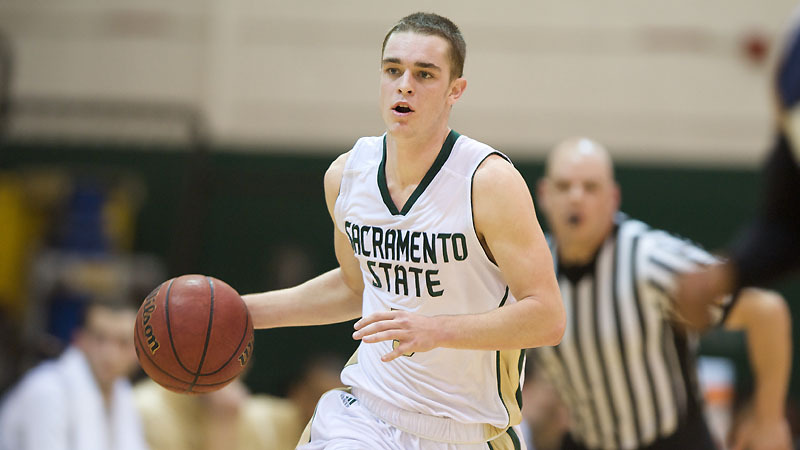 Garrity now is averaging 6.8 assists per game, and continues to lead all freshmen in the country in that category. CS Fullerton is a good team, and there is no shame in losing to them, but MSU looked so bad in the first half. They were on the wrong end of a 23-2 run in the first half, and ended it down 47-24. They battled in the second half to make the final score look respectable, but the outcome was long determined. MSU's problem right now is that with their current roster, they need both Shawn Reid and Christian Moon to be stars for them to have a chance against good teams. That is simply not their games, especially Moon, who has been struggling in recent weeks. The worst part is that after the first half, it looked like NAU was going to be one of the most impressive teams in the conference for the night. Then, the second half happened. NAU had a 45-26 lead headed into the break, but UC Davis outscored them 44-20 in the second half of play. That is not good against a 5-22 team at home. The Lumberjacks did get two bright performances. Senior Durrell Norman was fantastic on senior night, finishing with 26 points and seven rebounds. Norman is a guy I enjoy watching, so it is sad to see his career come to an end. The future was shown as well, as freshman Gaellen Bewernick had 14 points (7/8 FG) and 13 rebounds, nine of them offensive. He is a nice building block for whoever the next coach will be. What do you think of the order, and of the games this weekend? I think that this shows that the conference is weak this year. Montana and Weber State are very good though. You know I can't really argue with that right now. Montana and Weber State I think are two excellent mid-major teams and either team could win a game (or two if they got a great matchup) in the Tourney... everyone else looks weak, and seems to have recurring problems that they can't solve.